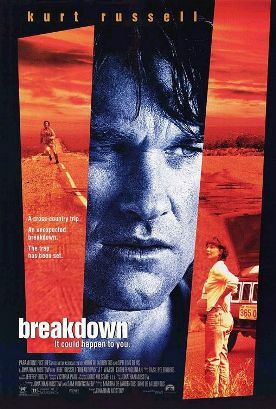 Breakdown by Jonathan Mostow is a superior sort of thriller that is a step in the right direction after recent Hollywood examples of the genre—that is, in the direction of the things that ordinary, reasonable people really do fear. Which is to say not unbelievably big Amazonian snakes or volcanos erupting in downtown Los Angeles or deranged serial killers, all of which are extremely remote eventualities, but something as simple as a breakdown on a lonely road where the guy who stops to help you turns out to be a kind of latter-day pirate, ready to kill you for the clothes you stand up in because he knows that he will be long gone before you are ever found. If you are ever found. It does, for at least part of its length, seem vaguely plausible, and the special effects, mainly vehicular, are not wildly beyond the bounds of probability. Kurt Russell in the lead role of Jeff Taylor, a somewhat impecunious yuppie, who is transformed from the “I don’t want any trouble” kind of suburban wimp to a lean, mean killing machine in the course of the picture, is not completely beyond belief either. What is hard to deal with, are the many loose ends. The plot is not quite tightly constructed enough. These include the little greasy spoon, Belle’s Diner, where Taylor’s wife (Kathleen Quinlan) is supposedly taken by the evil trucker, Red Barr (J.T. Walsh) to call for help when their car breaks down. Are the sinister looking people herein part of the conspiracy or not? Instead, all this more subtle stuff is sacrificed for the excitement of car chases and the like. What a surprise! The ending is also somewhat disturbing. Not because (as Roger Ebert complains) one of the bad guys is killed by one of the good guys in sheer vengeance, but because it eschews the usual coda in which order is reestablished, and there is some kind of summing up. Instead of the main characters’ exchanging solemn banalities as the police and paramedics arrive to clear up the mess, we find them alone and silent at the prospect of the destruction all around them. It is a bleak almost despairing ending and a sign in itself of the sort of social breakdown that the film is ostensibly exploiting in order to frighten us with.